Is blogging big business? Probably not for most of us. I expect that the majority of bloggers write blogs because it's their hobby. They enjoy writing, and publishing their work in way that was never possible before the internet. For a few people, blogging is a serious business. Blogging can be an important marketing tool for an existing business, or for the most popular blogs you can generate a regular income from advertising. Some of the best blogs are a collaborative effort. Rather than seeing posts by just one person there's a group of people regularly posting to the same blog. Whatever kind of blog you have you can now boost traffic to your blog by registering a blog account on billion7. You can now choose a background color when you create your e-card. Just click on the tiny color wheel and you'll see the new color picker control. Sometimes you can make you e-cards really stand out if they are on a dark background. We've also tweaked the layout of the email, so that the e-card is centered. Don't forget you can always try it out be sending an e-card to yourself, before you send them to your friends. 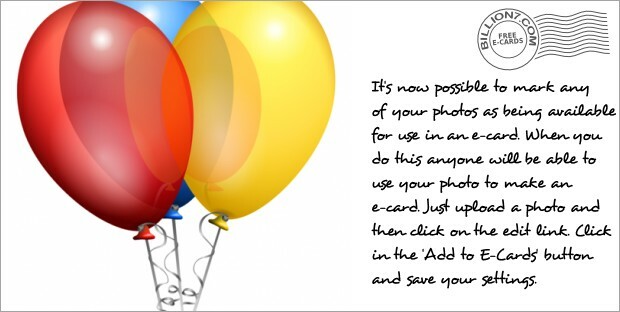 Allow other people to use your photos as an e-card. With your help we can create one of the best places on the web for sending e-cards. CHARTER FOR COMPASSION TRAILER from TED Prize on Vimeo. Billion7 is a global networking website, so we are interested in anything that has a global theme. Whether you are religious or not the words, "Treat all others as we wish to be treated", are good advice in any situation. They are words that I need to sometimes ask myself, "I'm I treating others as I would expect them to treat me?". We've just installed a new version of ImageMagick. What would we do without open source software? Whenever you upload a photo or send an e-card we use ImageMagick. It's the perfect tool for resizing images in different formats. When you upload a photo to billion7 we create four different copies. A small thumbnail image, and then small, medium and large versions. This makes viewing photos easy, regardless of your browsers window size. Above is an example of what a billion7 e-card looks like. 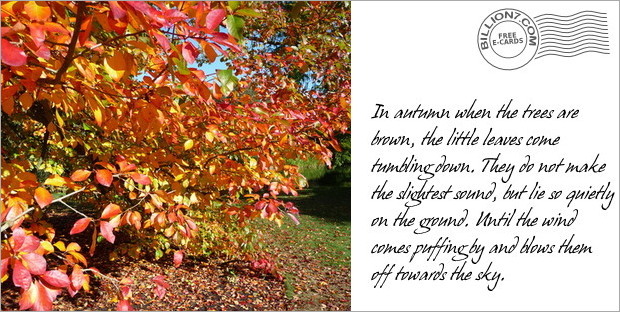 We've added some new handwriting fonts to our free e-card service. You can send anyone an e-card even if they are not a billion7 member. Just go to your profile page and click on Send E-Card. It's very easy to add your CV or Resumé to billion7. Just click on the Upload Document link on your profile page. The most popular formats for documents now have an icon. Although the Microsoft Word format is probably the most common, Adobe PDF and even plain text can be better as they can be easily displayed in a large number of web browsers. If there any more formats you would like then please leave a comment, or contact us. If you upload your Resumé don't forget to add your skills list to your profile so they can be easily searched for. Our thoughts go to all those who have been affected by this disaster. Every country has their own public holidays. Days to mark special events or religious festivals. Now there is a day that we can all share. A day to make us unite as a world and put our differences aside. Today is "The International Day of Peace". Read more about it here: www.internationaldayofpeace.org. When it comes to designing web pages, we believe that looks do matter. We've given the sign in and registration pages a fresh new look. If you've looked at a few MySpace profile pages you'll know how difficult it can be to read text on a page full of clutter and noisy graphics. Our aim at billion7 is to make a website with your help that is easy to use and easy on the eye. When it comes to dating, looks may be important to you, but looks are only skin deep as the saying goes. Here on billion7 there are many single guys and single girls, and billion7 can be used as a completely free dating website. I am just one of 6.7 billion people. You are just one of an unimaginable number of people. We are all different. We can be special and we can be ordinary. We have different thoughts, different ideas, different religions, we are short, tall, fat, thin, young, old, and everything in-between. It is often easier to talk about what makes us different, than what we all have in common. Do you believe that we all have common values? What are these values? Sometimes we all need reminding. Please leave a comment. We've now added the ability for billion7 users to add comments to this blog so I thought it would be good to have a debate on globalisation. The word global seems to be getting a lot of use these days: Global Warming, Global Economy, Global Trade, Global Communications, and of course our Global Networking Hub™. Is globalisation a good or a bad thing? If there are bad things about globalisation can it be controlled so that it is only a force for good? Recent financial problems have shown how vulnerable countries can be to global economic swings. All of the countries in the world have different resources. Ever since human beings have travelled there has been trade between countries. Does global trade lead to a more equal world, or are we becoming more divided? Billion7 has many Nurses registered from all over the world. If you know of any hospitals looking for extra staff then please ask them to search billion7. Since billion7 has been advertised on www.21stcenturyjob.com many nurses have been adding their profiles to billion7. With the average life expectancy increasing in many countries, and of course new babies increasing the world's population to nearly seven billion, nursing skills should always be in hot demand. We are in the process of creating a new billion7 blog. Many social networks have their own blog to let everyone know of any changes or new features to their website. We didn't want to be left out so here it is. Rather than use an existing framework like WordPress, we are writing our own blogging code from scratch. This means our blog will look like a fully integrated part of billion7 and we can make use of our eye catching themes. At the moment our blog doesn't have all the bells and whistles you'd expect such as adding comments, but we will add this in time. It does have an RSS feed, so you can subscribe to this blog with your favorite RSS reader and be informed when a new blog post is added. At some point we'd like to use our own blogging software, so that any billion7 member can create their own blog which would be accessed straight from their profile page. They could then customise it with our growing number of theme settings.